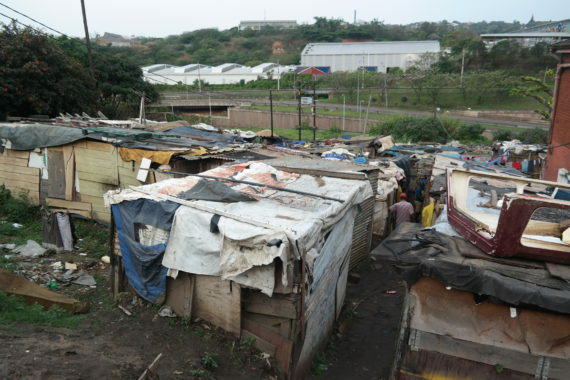 Kwa-Mathambo informal settlement is located in a suburban area of Red-hill on Old North Coast Road in Durban. When the settlement was enumerated in 2012, it consisted of 294 shacks with a total population of 565 people—most of whom were employed in the city center or nearby residential areas. Since then Mathambo leader, Ndodeni Dengo, estimates the population to be close to 800.Situated close to the city centre and industrial areas, the settlement’s advantageous location grants residents convenient access to schools, employment opportunities, and transportation. Despite these amenities, poor environmental and health conditions in Mathambo pose serious risks for residents. Mathambo experienced a serious fire in March 2016 which required 37 structures to be rebuilt. 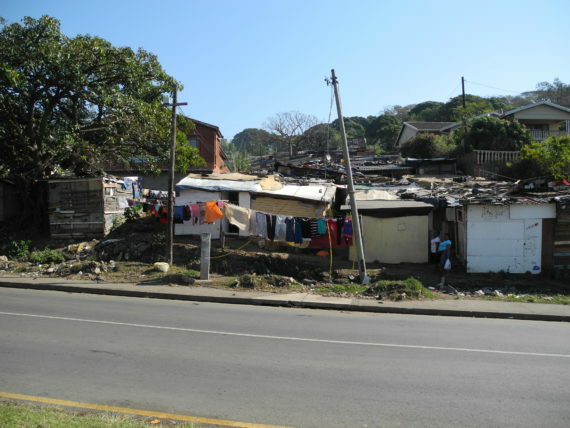 The reconstruction also offered an opportunity to pilot a reblocking layout in Mathambo which can serve as an example of reblocking during continued negotiations for a partnership between the Human Settlements Department and the Informal Settlement Network in eThekwini Municipality. Firstly, inadequate water and sanitation services—causing odors to emanate from dirty water—have led to cases of Tuberculosis. Prior to the re-blocking project, the entire community was served by only two ablution facilities—one for males, the other for females—with two showers. Secondly, low lying shacks were highly vulnerable to flooding from accumulated water runoff, given the steep topography of the land on which Mathambo lies. Thirdly, fires have repeatedly devastated the settlement. 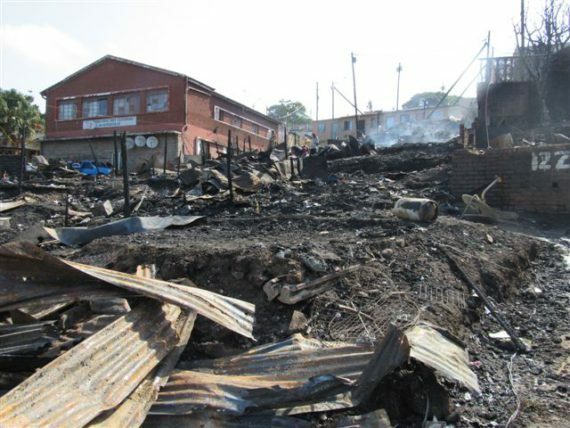 The first fire took place in 2013, destroying 258 shacks. In response, the municipality rebuilt 229 structures in the form of a transit camp and left 29 families homeless. The 44 shacks that were not affected by fire remained prone to future environmental disasters given the precariousness of construction materials—a combination of zinc, tarp, planks and plastics—and the layout of the shacks. In March 2016, the settlement experienced a second fire—displacing 40 families whose shacks, belongings, and identity documents were burned. Though it was not the primary impetus, the second fire expedited the process of re-blocking Mathambo. 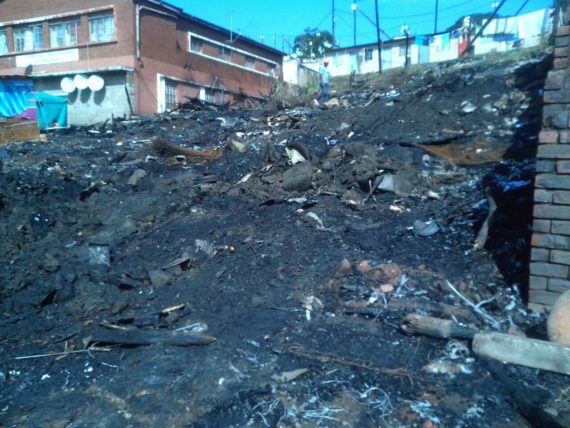 This section of KwaMathambo burnt down in the 2016 fire. Beyond environmental and health hazards, the settlement faces challenges including crime, harassment by police, low-paying employment opportunities given residents’ low levels of education, and the absence of facilities such as a community hall, church, crèche, learning centre and a community office given limited space in the settlement. Furthermore, despite the development of a municipal electrification program, electricity has proven to be a continued problem—leading some community members to resort to illegal wire connections which have caused fatalities. Furthermore, some residents contend with issues relating to unplanned children, contraction of sexually transmitted diseases, and alcohol and drug abuse. As the ISN began to mobilise the community, there was a certain level of resistance from transit camp dwellers, many of whom were wary of the municipality. Skepticism of the municipality–and its willingness to participate in the improvement process–largely stemmed from public neglect experienced following the first fire. The poor design of the municipal transit camp worsened conditions in Mathambo, particularly extrapolating issues relating to drainage and sanitation. Given environmental conditions, the municipality has indicated that the settlement is slated for eventual re-location within an unspecified timeframe—which residents speculate may signify over ten years time. The lack of transparency regarding future plans for the settlement contributed to the perception among residents that local politicians would often promise improvements in advance of elections—leveraging community members as voting tools—while failing to actually implement basic and necessary public services. During the process of enumerating the settlement, it became clear that the settlement urgently needed taps, toilet facilities and a proper drainage system. 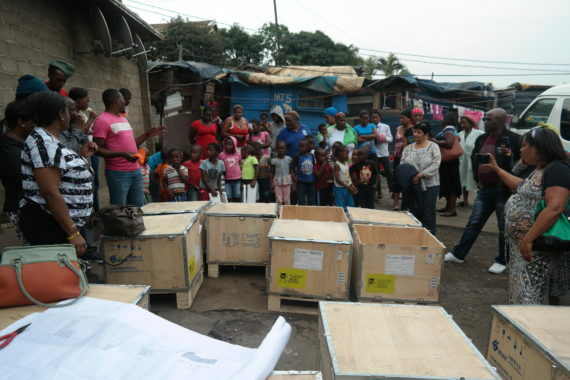 Despite initial resistance, through a series of community meetings, residents and community leaders – in cooperation with the Planning Division of eThekwini Municipality – identified re-blocking as a viable solution to improve conditions in Mathambo. To mediate relations between stakeholders, the ISN hosted meetings with members of the community, the land owner, neighbours, the Ward Councillor, the chairperson of the Rates Committee, and the municipality’s Planning Division. Mathambo community leaders use wooden boxes to speak about their reblocked layout to visitors. Re-blocking was planned as a Community Upgrading Finance Facility (CUFF) project, cooperatively funded by community members who practice two types of savings: participating in FEDUP livelihood programs and contributing to a community savings pool accessible to members at the year’s end. At the time of the most recent fire, the community had demonstrated their strong capacity for savings, with R8100 saved with a formal banking institution. To meet the community’s urgent needs in light of the second fire, CUFF issued a loan for the purchase of building materials—which is currently being repaid by the community in instalments. To prevent future fires, the project incorporated emergency precautions such as fire-resilient construction materials and fire detectors, while also improving access ways to facilitate entering and exiting the settlement. Additionally, the re-blocked layout will accommodate space for the 29 households displaced—and still shelterless— in the aftermath of the 2013 fire. 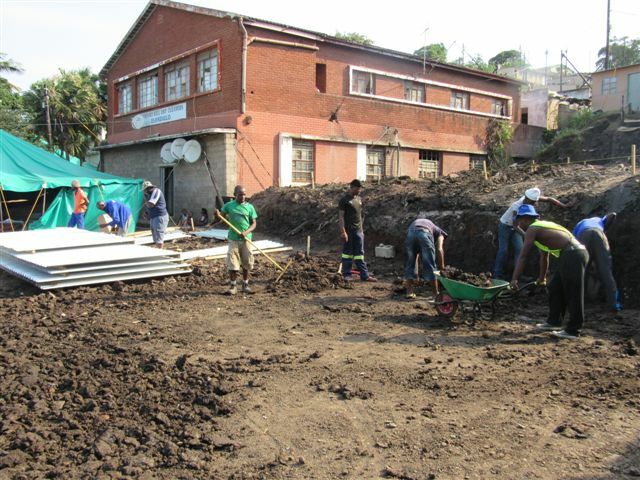 Mathambo residents begin reconstruction in the reblocked layout. Furthermore, re-blocking will improve the layout plan of the settlement, regenerating the neighbourhood’s “legibility” in the surrounding suburban environment. The project will enable the people of this settlement to take ownership of their upgraded facilities, potentially solving the challenge of service vandalism. 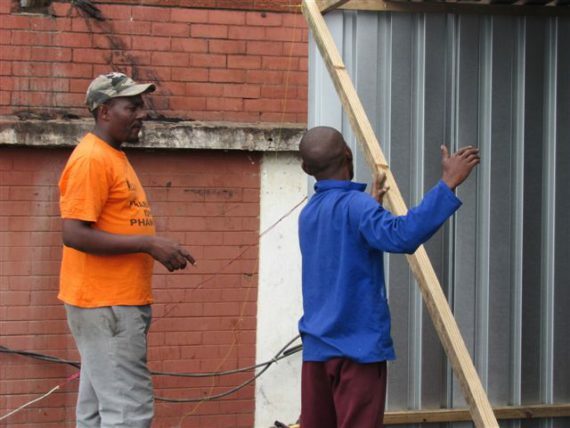 Given that the city has identified a few informal settlements for electrification, the reblocking project may also influence the city’s potential selection of Mathambo as a beneficiary. As of June 2016, structures have been constructed in accordance with the newly designed community layout, windows have been fitted, and in some cases, floors have been cemented with materials provided by the municipality. To address the persistent challenge of flooding, plans are being developed to construct retaining walls, walkways, proper drainage to control water and eradicate property damage during heavy rains. The project represents a positive step towards a relationship between Mathambo and the eThekwini Municipality that is free of political divisiveness, while also demonstrating residents’ capacities to mobilise towards improving conditions in the settlement while waiting for government housing. Through engaging with the ISN and jointly financing the project through CUFF, the project has also strengthened the relationship between Mathambo and the SA SDI Alliance. Ultimately, the community would like for the government to integrate Mathambo into the neighbouring formal area by constructing in-situ houses. Given the settlement’s favourable location, re-location should be considered as a last resort. Community members believe that the successful partial re-blocking of Mathambo—the first settlement to be re-blocked in KwaZulu Natal— can serve as a precedent to inspire future projects in the eThekwini Municipality and elsewhere.